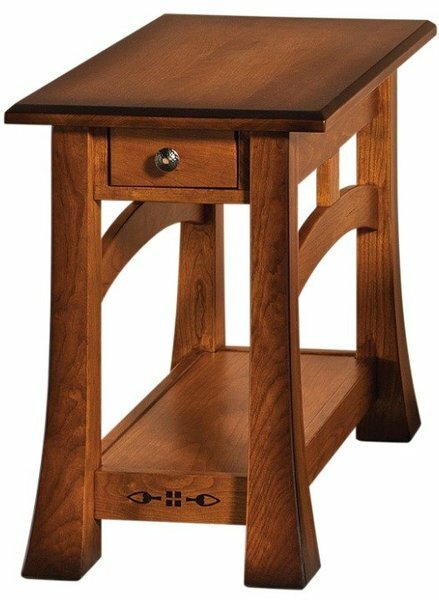 Measuring 16"W x 26"D, x 24"H, our Amish Brady Small End Table makes an especially great mission-style option for a 1920's bungalow style home. What it lacks in size, it makes up for in style with a 1-inch thick top, soft close dovetailed drawer, legs connected by mullion arches and that taper out to create a dramatic statement at the feet, open shelf base, and dyed tupelo inlays. Shown in cherry with FC-N3176 Malguania stain with burnishings and #10 sheen, and #51 hardware.